Transparency Market Research has published a new report on the Saudi Arabia adhesives and tapes market. As per the new report, the Saudi Arabia adhesives and tapes market will grow at a 5.50% CAGR during the period from 2015 to 2023. The report, titled ‘Adhesives and Tapes Market - Saudi Arabia Industry Analysis, Size, Share, Growth, Trends and Forecast 2015 - 2023’, states that the Saudi Arabia adhesives and tapes market stood at a value of US$632.5 mn in 2014 and is predicted to reach US$1,008.9 mn by 2023. The Saudi Arabia adhesives and tapes market is predicted to develop rapidly during the forecast period due to the increasing demand for adhesives and tapes from the construction and packaging industries across the region. Expansion of trading activities in different areas of Saudi Arabia will further propel the adhesives and tapes market. The Saudi Arabia adhesives and tapes market is segmented on the basis of technology, formulation, products, and end user. By technology, the Saudi Arabia adhesives and tapes market is divided into pressure sensitive, hot melt, and others. In 2014, the pressure sensitive adhesives and tapes market was in the leading position, with a 50% market share. By formulation, the market for adhesives and tapes was dominated by water-based formulations in 2014. As water-based formulations emit minimum volatile organic compounds and are thus eco-friendly, they have been commonly used in many industries. Based on product type, the Saudi Arabia adhesives and tapes market is divided into acrylic, epoxy, PVAc, EVA, and polyurethane. In terms of volume, in 2014, the Saudi Arabia adhesives and tapes market was dominated by acrylic products. Polyurethane (PU) is used in high volumes in industries such as construction, automotive, and footwear in Saudi Arabia. The Saudi Arabia adhesives and tapes market is fragmented in nature, as many prominent companies offer adhesives and tapes. The Saudi Arabia adhesives and tapes market comprises a large number of multinational players and a relatively small number of domestic players. The multinational companies have vertically combined operations, offering them a competitive advantage over the domestic players. Some of the leading players in the Saudi Arabia adhesives and tapes market are Henkle AG and Company KGaA, BASF SE, Ashnald Inc., 3M Company, Nitto Denko Corporation, The Dow Chemical Company, Sika AG, Dymax Corporation, Avery Dennison Corporation, and H.B. Fuller Company. 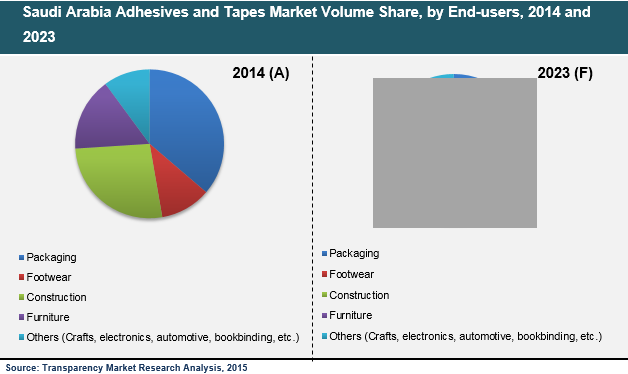 Rising demand for adhesives and tapes from various industries such as bookbinding, construction, crafts, furniture, footwear, packaging, and medical will drive the Saudi Arabia adhesives and tapes market during the forecast period. Constant demand for adhesives and tapes from end-use industries including construction and packaging is expected to propel the Saudi Arabia adhesives and tapes market during the forecast period.